The following is a partial summary of the conclusions from the fxempire.com weekly analysts’ meeting in which we share thoughts about future scenarios and market movers. QE’s influence on employment is waning. Deflation shows signs of weakening. While the probability of inflation may be low, its risks are significant, so the Fed must be cautious, especially given its poor forecasting record. The Federal Reserve has made clear that it won’t raise rates until US employment improves and that its continued recovery no longer needs exceptionally accommodative Fed policy. Continued low inflation relieves the Fed of any pressure to tighten before it is satisfied that US employment. While the Fed claims otherwise, it surely considers that rising US rates pressure the global recovery as they force higher risk economies to raise rates or see capital outflows to the perceived better risk/reward of the US. Repeated US moves to ensure USD liquidity to European banks during various stages of the EU crisis confirm that the Fed understands the potential for global economic weakness to hit the US too. Guess what? All of the above drivers of continued low rates are weakening. Below we consider these and another reason why the Fed might start at least signaling a rising chance for tightening sooner. 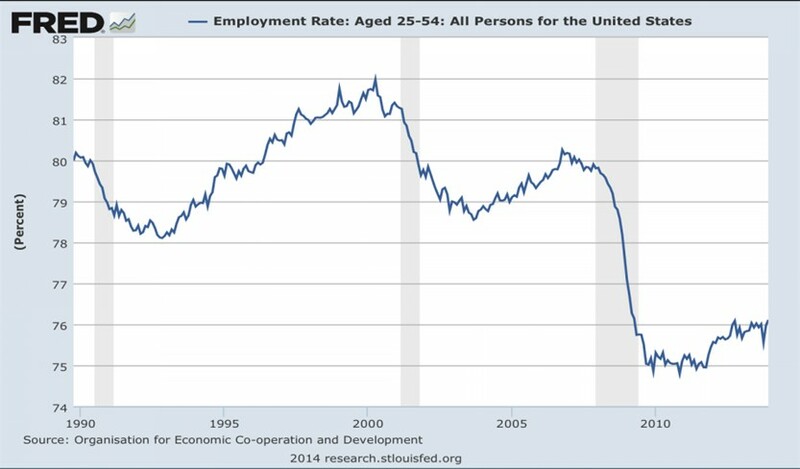 There is still plenty of overall slack in US labor market. 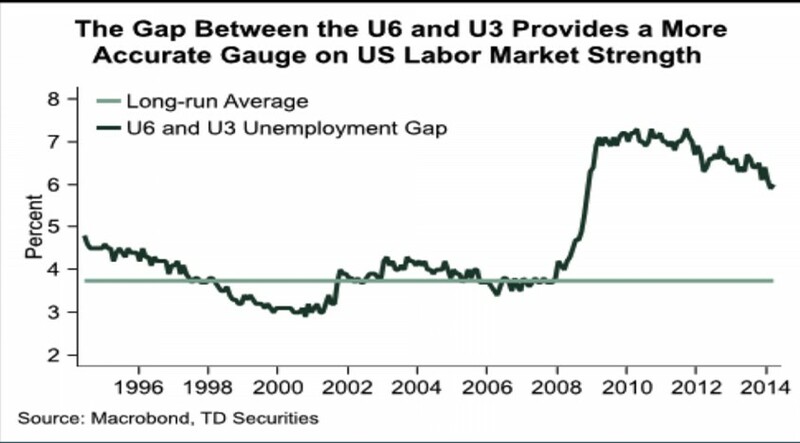 U6 includes all unemployed, including those who want work but have stopped looking and is a better gauge of true unemployment. 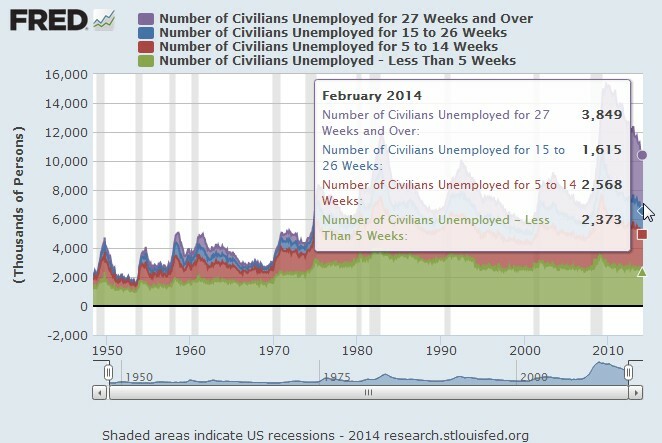 U3 measures only those who are unemployed but still actually looking. However much of the U6 “too discouraged to look” group is unlikely to benefit from more QE. 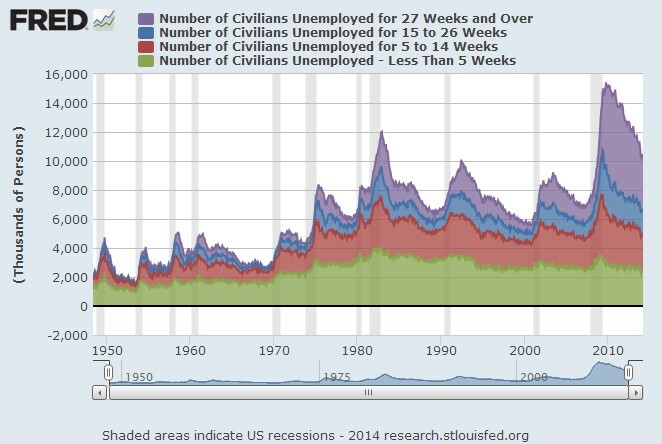 The key point of the chart above is that the long term structurally unemployed remain by far the largest segment of the unemployed, despite years of assorted stimulus. The implication is that this largest group of jobless will not benefit from more QE. How much larger? Here are the most recent figures, which show the long term unemployed at its smallest percentage of overall unemployed since the start of the Great Recession. 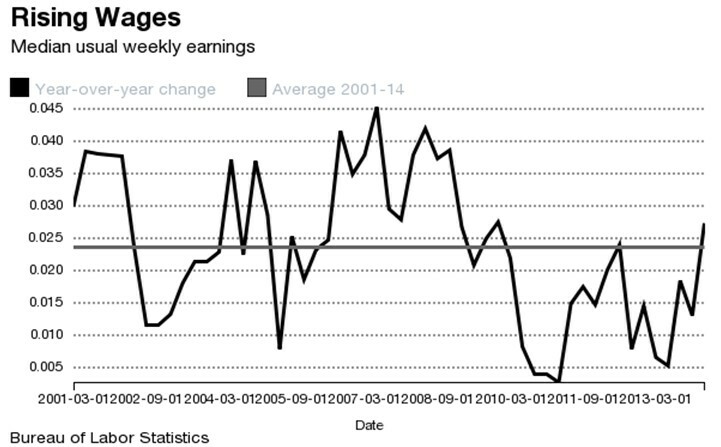 Median wages are rising and are now above their 14 year average. The employment rate is rising among those in prime working years, those less likely to be structurally unemployed. 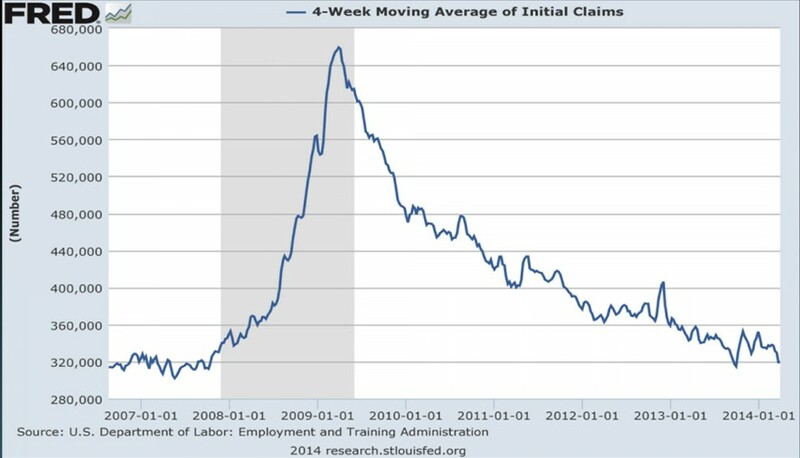 The 4 week average of new weekly jobless claims continues to fall. The above improvements are not solely due to discouraged workers leaving the workforce and reducing the number of those seeking work. The US shale gas an oil boom has given the US a huge cost advantage in the chemical and plastics industries. New investments in ammonia plants are rising at an exponential rate, thanks to natural gas prices that are $4.40 (per BTU) in the US and $15 on Asia’s spot market. A study by the International Monetary Fund found that after over 50 years of US industrial decline with each recession, the pattern has actually reversed in recent years. Led by machinery, computers and electronics, America’s share of the global manufacturing pie has stabilized at 20%, the same as China’s. The consumer-spending driven, services oriented US is actually as big a manufacturing power as China. Granted, US manufacturing is less labor intensive than China’s. The main point, however, is that manufacturing is once again a source of job growth. CPI averaged 1.4% in the past 12 months, but jumped to 1.5% in March from 1.1% in February. The PPI, a measure of what producer prices, increased 0.5% in March and was up even more excluding food and energy (0.6%), accelerating 1.5% year over year. Average hourly earnings for American workers appear to finally be running consistently above a 2% annual growth rate. 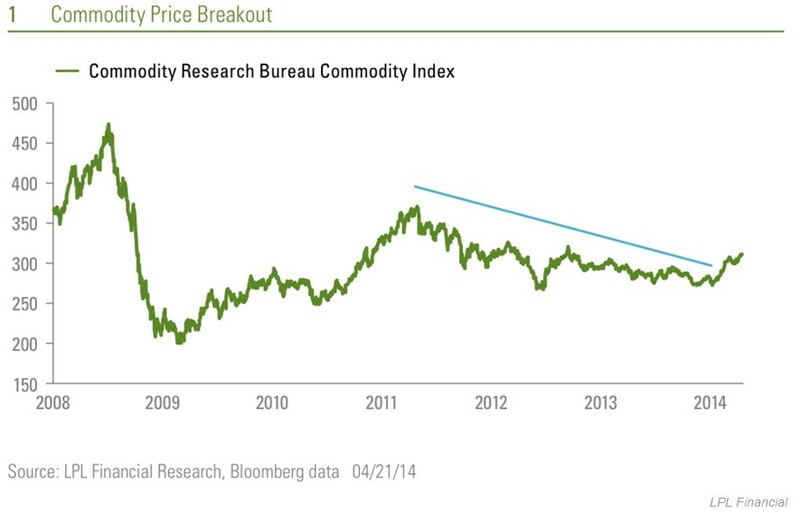 After dropping for three years, commodity prices, measured by the Commodity Research Bureau Commodity Index, appear to have started to rebound, as shown in the chart below. Food prices are rising in part due to the extended effects of severe weather, both cold and drought. Fuel prices have also been rising — with gasoline prices up 45 cents in the past five months to a national average of $3.65 per gallon. Granted, inflation’s bottoming does not mean it’s set to rise any time soon. However the Fed’s ability to control inflation in the brand-new post QE world is one big fat unknown. The Fed’s past record on forecasting major turns in the economy is not encouraging. It needs to be especially cautious about allowing inflation to spike. 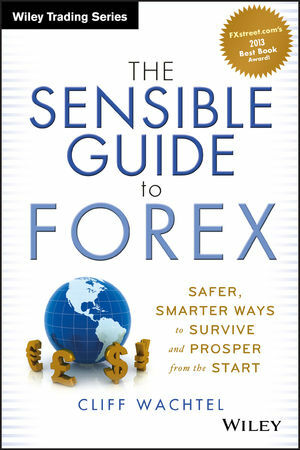 The risks from inflation, specifically from the rapidly rising interest rates that could come with it, are greater in the new post stimulus world. Rising rates mean rising interest expense. Gross government debt (federal, state, local) has grown from ~$7 trillion in 2000 to ~$20 trillion in 2014. Debt reduction will be incremental at best, so most of that $20 trillion will be rolled over at prevailing future rates, not cut, in coming years. That could make the budget for debt service rival that of the defense budget. The main point here is that at a time when public debt levels are almost triple what they were in 2000, the Fed needs to be very careful about keeping inflation in check, lest that ultimately drive US borrowing costs up. There’s little debate that by traditional valuation measures, stocks are already expensive. The only real valuation debate centers around whether those measure are still valid in a time historically low interest rates. Of course technically such concerns are not part of the Fed’s purview. In the past, any hawkish surprises, and the taper tantrums that followed in global markets, included rising rates and reduced credit in emerging markets, including Russia. Generally that’s not been a desirable outcome. However financial pressure is the only real tool of coercion persuasion the US has, but it’s a potent (albeit risky) weapon, as covered in depth here and here. Given Europe’s ambivalence towards meaningful sanctions (for reasons we discussed in depth here) the US may be forced to go it alone if meaningful economic sanctions are needed. As of this writing the US announced its latest sanctions against Russia in retaliation for its not-so-covert aid and encouragement of Russian separatists as a part of a feared prelude to a second territory grab. Markets rose, because they were even softer than expected. This last point is a less likely motive, and of course foreign policy considerations are also technically beyond the Fed’s purview, like stock market fluctuations. That said, it’s not inconceivable that such concerns might make the US open to at least some signals of possible sooner tightening, if the above mentioned reasons gain traction. If the Fed in fact the fed does decide to flash signals of possible faster tightening (sincere or otherwise), then what? The USD and bond rates rise. Emerging market currencies and assets get hit to varying degrees. Russia might suffer more, given that it’s already under pressure. The harder part is how long that lasts. That depends how much the above conditions weigh on Fed considerations at the time. It also depends if a prolonged period of rising tightening expectations brings the anticipated liquidity trap symptoms, (see here and here for explanations and illustrations) and if so, how greatly they’re felt. ← EURUSD Weekly Outlook: More Volatility Likely, But Can The Pair Finally Break Out?